START: Santa Rosa at 10:50am Neutral Race Start at Santa Rosa Ave. and 3rd St. FINISH: Santa Rosa approx 3:06-4:16pm (depending on speed) at Santa Rosa Ave. and 3rd St.
1 SPRINTS: W 3rd St, Santa Rosa, CA 1, at 12:28pm. 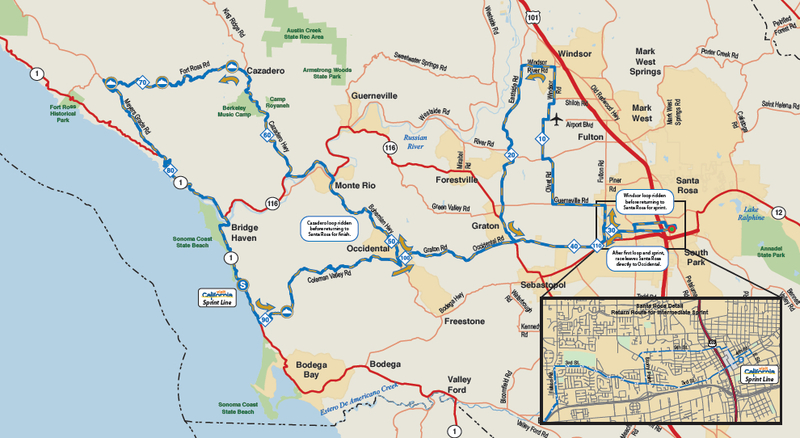 4 KOMs: Cazadero Hwy. at 1:17-1:56pm; Ft. Ross Rd. (1st x) at 1:27-2:09pm; Ft. Ross Rd. (2nd x) at 1:34-2:19pm; and Coleman Valley Road at 2:16-3:12pm. 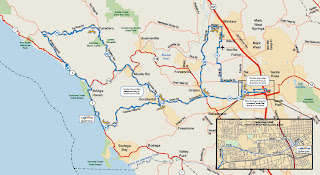 Local Events: City of Santa Rosa events planned surrounding the Amgen Tour of California May 10-13th. On the first line, the start time is always definite. In the last two columns every street and turn is listed. Because the organizers of the race are not certain how fast the riders will be racing, they give several approximations of times based on average speed of a rider. The first column lists the slowest possible time at 22 mph for this stage, (speeds will vary based on flat or climbing stages). Column 2, 3, and 4 list other faster times according to increasing speeds. As fans it is best to be there by at least the fastest time listed on the log, but not to expect the riders until the slowest time listed in column 1 of the log. This insures that you will not miss seeing the race. Try to arrive much earlier to enjoy the atmosphere and avoid traffic. Pay attention to road closures (listed below under each stage when I found them available online). 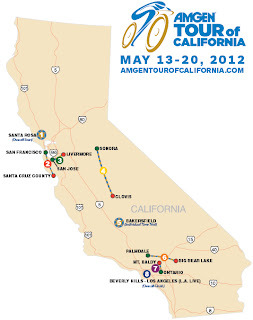 Amgen Tour of California - Thank the Sponsors!